Mainly composed of new tunes, the 15 tracks on Migration Blues also include covers of Bob Dylan’s “Masters of War” and Woody Guthrie’s “This Land Is Your Land.” An arrangement of the traditional “Mornin’ Train,” closes the opus. 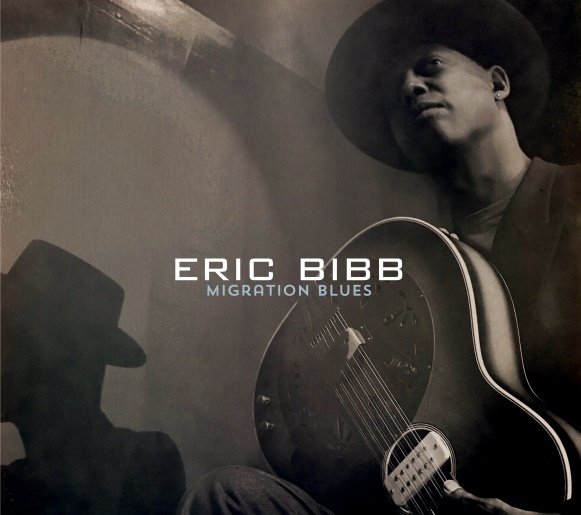 In a career spanning five decades, 37 albums, countless radio and TV shows and international touring, Eric Bibb has become one of the leading bluesmen of his generation. He’s also one of the most respected blues singer and songwriters, whose music is always reverent, keeping one foot in the blues and folk storytelling traditions. “The joy of making music and sharing it with you is a big part of my life,” Bibb says in the album’s liner notes. “Another big part is travelling and getting to know folks from many places. This exposure to different cultures has led me to think of myself as a citizen of the world, blessed with countless opportunities to recognize my connectedness to people everywhere. Feeling this connection makes it easier to let go of my pre-conceived notions and prejudices toward people and cultures that are outside of my experience. “The way I see it, prejudice towards our brothers and sisters who are currently called ‘refugees’ is the problem. Fear and ignorance are the problems. Refugees are not ‘problems’ – they are courageous fellow human beings escaping dire circumstances. Fleeing from war and unbearable hardship is something people have been doing all over the world for millennia. It’s nothing new. Every culture has its own migration stories and songs. Eric Bibb is currently on tour in Canada with a series of U.S shows to follow.